Dr. Roger Kemp is a lecturer at the B. Interior Design (Hons.) program, at the School of Architecture and Urban Design, RMIT University, Melbourne, Australia. Raphael Kilpatrick is a sessional lecturer at the B. Interior Design (Hons.) program, at the School of Architecture and Urban Design, RMIT University, Melbourne, Australia. Dr. Anthony Fryatt is the program manager at the B. Interior Design (Hons.) program, at the School of Architecture and Urban Design, RMIT University, Melbourne, Australia. Our inclination to control aspects of a design process and decision-making can be both helpful and limiting. Sometimes allowing ‘unknowns’ or less predictable processes can offer up ideas or methods that present new imaginings and opportunities. Physical making, as a method for design, can allow ways of thinking through a continual adjustment and negotiation due to requirements of materials, tools, processes or collaborative engagement. This visual essay discusses the production of a collaborative model titled the ‘Collective Network City Model’ which formed a site for interrogation, negotiation and exchange by a group of 20 undergraduate interior design students. The Collective Network City Model was a collaborative model of an imagined city/urban condition constructed by 20 students over a period of five weeks that formed a site of interrogation, negotiation and exchange that inturn, provided the basis for a set of individual design propositions titled Exchange Space. The Collective Network City Model was employed as a bridging project, linking a six week duration competition brief relating to the Tonle Sap lake in Cambodia (responding to very specific set of issues and outcomes) to a more speculative proposition situated within an imagined urban setting which required the student to develop their own brief responding to the idea of exchange. Given the intensity and specificity of the Tonle Sap competition and a further 6 weeks of the semester remaining, there was a unique opportunity to consider how the studio could generate a hinge from the previous work and to fold the substantial learning into a very different set of criteria and project structure whereby the student took the lead in determing the direction for the work. As tutors, we were interested in asking the students to shift their operations from one of respondent to that of the speculator. Earlier in the year, a public discussion about graduate capabilities of university graduates, involving employer and academic groups, was aired on Radio National. Employers identified desirable attributes as teamwork, initiative, enterprise and evidence of “fit to culture”. The notion of “fluid intellegence” or “fluid knowledge”  was cited as a key attribute. Much of the debate in this discussion related to how well these attributes were embedded and indeed assessed in University degrees around Australia. Acting as an interloper into the initial trajectory of the design studio, the first class after the mid semester break signalled the begining of part two of the studio. This began with a request for students to bring to the class nine graphic images that responded to ideas of ‘networks’, ‘borders’ and ‘differences’ - key ideas and sensibilities drawn from the previous competition brief. These images were then enlarged, distorted, cut-up, collaged [Figure 1] and taped/glued together to produce a complex set of relationships through collaged materials that could be read as a type of map of urban conditions. The collective collage was a tool to introduce and begin a new project quickly. It was akin to making a mark on a blank piece of paper in order to simply begin. Without having a detailed sense of intended outcome, each decision required some rationalising relative to its adjacency, sensibility to other groups and agreed purpose through conversation or simply the action of location (sticking down). As a dynamic process, its form changed and shifted over the three hours that we worked on it. At some point in this indeterminate state, each individual made decisions in relation to color, scale, texture, structure and complexity [figure 2 + 3]. It was quite a literal take on what each designer (student) could “bring to the table”, and then how we could tap into a collective endeavour. 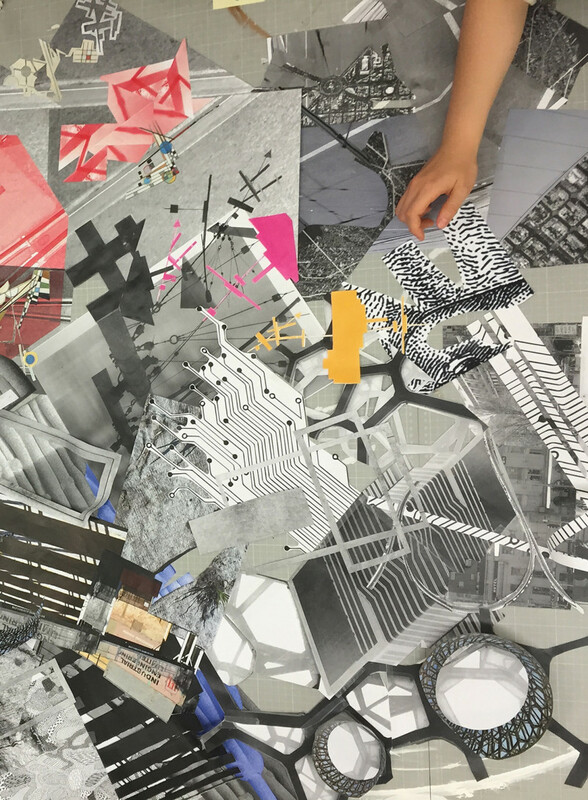 The collaborative collage formed the basis for the collective network city model. Students remained in the previously organised groups set up for the first half of the semester and were assigned a section of the collage [figure 4]. Having been allocated a territory (portion of the collage), each group then began to determine a collective approach to a translation from the two dimensional image into a three dimensional construction. Each group was asked to determine a unique collective approach to their territory with the proviso that the model should not attempt to represent buildings, but instead construct ‘networks’, ‘borders’ and ‘differences’. A steel table with a 25mm x 25mm mesh surface was made by the tutors to provide a surface that the students could construct their territories. The mesh enabled the construction to be fixed above, below or through – providing further opportunities for decision making. Ultimately, the Collective Network City Model became an assembly of remembered and invented urban spatial moments [figure 5-12] drawn from reflecting on experiences of other cities (real or fictional). Its importance was that of a collaborative and generative tool, always in flux through continual adjustment, additions and negotiations. It became a site that provided a starting point and framework for 20 individual project briefs - all speculating on ideas of cities as a space for exchange [figure 13 + 14]. Fluid intelligence - pertaining to ones ability to respond to new or novel situations and problems as distinct from the direct application of existing skills, knowledge and experience. There is often a significant delay when asking students to choose their own site for a design brief due to a desire to make the ‘right’ decision and avoid problems. This illustrated methods of process driven approaches to support decision making and the embracing of problems as a inherent aspect of designing. See Thea Brejzek and Lawrence Wallen, discussion of the autonomous model in their book titled The Model as Performance: staging space in theatre and architecture. ‘Networks’, ‘borders’ and ‘differences’ are terms adopted from Christian Schmid’s 2014 essay titled “Networks, borders, differences: towards a theory of the urban”. Brejzek, Thea, and Lawrence Wallen. The Model as Performance: Staging Space in Theatre and Architecture. London: Bloomsbury Publishing PLC, 2017. Douglas, C, and Downton, P. “Re-Making: Ideas and Models.” in Homo Faber: Modelling Ideas, ed. Mark Burry, Andrea Mina, Peter Downton, Michael J. Ostwald, 65-69. Archadia Press, Sydney, Australia, 2007. Downton, Peter, and RMIT University, School of Architecture Design. Design Research. Melbourne: RMIT Publishing, 2003. Downton, Peter. “Making dust: acquiring knowledge.” in Homo Faber: Modelling Ideas, ed. Mark Burry, Andrea Mina, Peter Downton, Michael J. Ostwald, 10-15. Archadia Press, Sydney, Australia, 2007. Danvers, John. “Towards a Radical Pedagogy: Provisional Notes on Learning and Teaching in Art and Design.” Journal of Art and Design Education 22, no. 1 (2003): 47-57. Lim, C. J, and Liu, Ed. Short Stories: London in Two-and-a-half Dimensions. Abingdon, Oxon; New York: Routledge, 2011. Schmid, Christian. “Networks, Borders, Differences.” In Implosions/explosions: towards a study of planetary urbanization, pp. 67-81. Jovis, 2014.